This essay is the summary of main gists of my recent book “How to Save Deadly Disease of Japanese Economy(Japanese language book) published by Gentosha Inc. at the beginning of March, 2018. Japanese government’s fiscal debt has been accumulating acceleratedly for the last decades. The level of the debt relative to GDP reached recently around 240%. This is the worst of the countries in the world, and is much worse than the ratio Japan has experienced right after the defeat of Pacific War in 1945. The basic reasons behind this mushrooming fiscal debt are (1) aging of population which increases social security expenditures, and (2) slow or none growth of the economy since 1990s, often called, Japan’s lost two decades. The population aging is expected to continue for about another half a century, and to accelerate around the mid-2020s, and the economic growth is expected to be sluggish in the long run because of the decline of workforce, and consequently, the fiscal debt is expected to grow more. Unless major and fundamental changes take place in policy management in economy and society, this dangerous trend would continue. In fact, there are on going trends in government fiscal debt and aggregate household net saving leading to squeezing the net national saving within a decade or so which is the basic source of purchasing government bonds. Under such circumstances, in order to issue new government bonds to finance the government budget, Japan will need ask foreign investors to purchase Japanese government bonds(JGB). The foreign investors, however, would not purchase JGB at the current rate which is artificially lifted by massive purchases by Bank of Japan(JoB). If they purchase at lower prices, the result would be substantive reductions of JGB prices, and hence sharp rises of interest rates. This would jeopardize government fiscal management as well as corporate financial management, and may well lead to fiscal and business collapse of Japan. The basic way to avoid such a crisis is to realize fiscal reconstruction which can be achieved by the three major ways: (1)reduction of fiscal expenditure, (3) enhancing economic growth by which to increase tax revenue, and (3)increases of taxes. The Japanese government has been attempting such measures for the last decades. However, many administrations have not been able to achieve desired results. The current Abe administration seems to have weakened its will to keep fiscal discipline. In this essay, I will describe the nature of the problems, and attempt to show possible remedies to overcome this issue hoping to provide a better country to the next generation. Let us first take a look at what the level of accumulated government debt. Figure 1 shows the levels of the accumulated government debt for the recent half a century. The figure shows the data from 1965. The fiscal debt prior to 1965 had been negligible because Japanese government followed faithfully the rule of stringent “fiscal law” enacted in 1947 which prohibits rigorously the issuance of government bonds without the legal commitment of redemption. The government issued a bunch of JGB for the first time after the war in order to support the economy which suffered from an acute recession in the wake of Tokyo Olympics of 1964. The amount of JGB issuance has increased secularly and the accumulated amount increased somewhat acceleratedly since then until now. Recently, the accumulated outstanding JDB amounts to as much as twice the GDP. This figures shows the data of JDB in a narrow sense. The data for more inclusive definition of the fiscal debt is currently around the level of 240%. Now, let us take a look at how the pace of accumulation of JGB as compared with other advanced economies in the world. Fig. 2 shows the data. We can see from this Figure that Japanese government debt was not as bad until the beginning of 1990 as today. During the 1990s, the level increased sharply and exceeded by an increasing margin the other nations. The 1990s is the first half of so-called “lost decades” of Japanese economy when the economy suffered from very low growth with perpetuating deflation, and when Japanese population was being aged much faster than other countries. 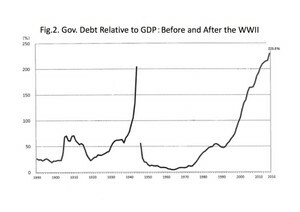 Still, let us take a look at the data of Figure 3. which compares the changes of accumulated government debt relative to GDP for two different periods: one is post WWII period and the other is pre-war period up to the end of WWII. Surprisingly, the ratio for the recent year such as 2016 is much higher than the ratio immediately after the war when Japan was defeated in the war and the economy was fatally devastated. This fact shows how dangerously high the current level of accumulated government debt. 2. Why and how the fiscal debt mushroomed? During this period, since the economic did not grow and prices have been rather declining, wages did not increase or in many cases declined. Since the employee’s prescribed contribution to the social security is linked to their wages, the contributions from the insured people did not grow during this period. The other is rapid aging of population during this period. This is the period in which “baby boomers” who were born shortly after WWII have been aging from the middle to senior age brackets and their social security payment has kept increased somewhat accelaratedly. The no increase of contributions on the one hand and rapid increase of social security payment on the other enlarged the gap between income and expenditure of social security fiscal account increasingly large, and increased the deficit of social security account. To the extent that this deficit could not be financed by contribution revenues from the insured people, the government had to make up the gap by deficit financing, namely, issuance of government bonds unvouched by legal redemption, which ended up increasing the accumulated government debt. Even in subsequent period such as 2010s, which presumably after the so-called “lost two decades,” the economic growth has been still sluggish, wages did not increase and the populations aging is proceeding continuously rapidly. Therefore, the increasing trend of the deficit of social security continues, and the government is obliged to issue greater amount of JGB to finance the debt. The higher the level of accumulated debt to GDP, implying the higher risk of repayment incapability, the greater the risk of fiscal collapse. There is a reason to believe that the level of accumulated fiscal debt will increase much more sizably during the 2020s than now. This is because the postwar baby boomers will get older beyond the age mid-70s, when the medical cost per person will increase unproportionately after the threshold of the mid-70s, and will boost the increase of medical cost, and consequently, the government fiscal debt. On the other hand, with the aging of population, the household saving ratio tends to decline because the aged people tend to dis-save rather than to save. 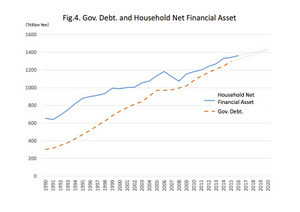 The figure 4 compares the changes of the level of the aggregate net saving of households on the one hand, and the accumulated government debt on the other. Conspicuous is the fact that the margin of the excess of household saving compared to the government debt has been narrowing for the last few decades for natural reasons as stated above. And it looks that the excess of saving to the government debt will approach to zero around 2020s and is expected to be negative after a certain point of the crossing of the two orbits. This suggests a serious problem. It means that the basic funds for purchasing new government bonds run out. Under such circumstances, the Japanese government will have to ask foreign investors to buy JGB. Foreign investors will most likely be reluctant to buy the JGB at the recent price level since it is lifted artificially high by massive purchases of the Bank of Japan. Foreign investors would purchase JGB at much lower prices, and this will cause serious problems to Japanese economy. Since Japanese government relies heavily on issuance of JGB to finance its budget taking advantage of current extremely low interest rate, the substantive increase of interest rates would make it difficult for the government to finance its budget. Unless, Bank of Japan provides extra-ordinary lending directly to the government, the government will not operate normally. Business corporations would suffer from the similar problem since they have been used to rely on extremely low interest rate. Unless, swift, effective and powerful rescue measures are executed, Japanese economy may well suffer from serious problems of fiscal collapse and consequently economic collapse which may destruct economic operations of both public and private sector victimizing the life and activities of the population. 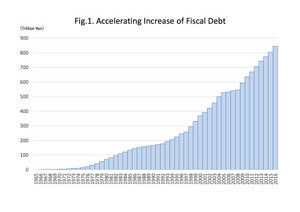 Given the current extra-ordinary mushroomed structure of accumulated fiscal debt, the risk is quite high that the economy will be led to collapse by impacts of any major stimulus or so-called “triggers.” For example:(1)the government debt surpasses aggregate net household financial asset as mentioned above, (2) continuation of current account deficit which tends to lead to lowering exchange rate of the yen, (3) actions of major speculators taking advantage of market expectations for lower JGB prices, (4) military conflict, (5) political turmoil etc. 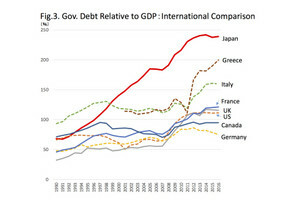 Some argue that the government debt issue in Japan is over-emphasized. They say that the Japanese debt is not that much serious. They point to Japan still has much saving, most of JGB is owned by the Japanese, Japan has an economic viability etc. However, one has to be aware of the fact that Japan is not an exceptional country. Economic collapse or bankruptcy is not a rare phenomenon in the world. There have been ample experiences of economic bankruptcy in recent decades only to mention, for example, Venezuela in 2017, Argentine in 2001, Russia and Pakistan in 1998, South Africa 1985, Philippines and Brazil in 1983, Mexico in 1982, and Turkey in 1978 etc. In fact, Japan has suffered the most serious case of quasi bankruptcy in 1946. In this case, Japan somehow avoided to be caught in the default by the incredibly large and painful expense of sacrificing people’s financial and non-financial assets. To the extent the risk is evident, it must be the task and duty of political and economic leaders as well as the public to try their best to avoid the risk and try to construct better economic and social structure to minimize such risks of sacrificing innocent people, particularly for the next generations. The single most important way to avoid such risks is to promote forcefully to reconstruct the healthy balance of the national finance. One may call such effort as strengthening fiscal discipline. There are basically three main measures to pursue that goal. One is reducing the unnecessary expenditures of the government. One may put it as “stream lining” the government expenditure structure. This has been referred to and attempted over and over again by many administrations of the Japanese government for decades. One outstanding challenge has been attempted during the DPJ(Democratic Party of Japan)government in 2009. The administration claimed to carve out a few trillion yen of funds by stream lining government expenditures. But the result was not even one tenth of the target. The most important area of spending cut is the area of entitled spending、most notably social security spending. Since social security expenditure is the single largest area of spending, many plans have been proposed to stream line the expenditures. Just to name a few: long-term reduction of pension payment, increase of the eligible age of receiving pension payment from the current age of 65 to higher ages, reduction of designated official prices of drugs and medical services and promoting efficient operation of nursing houses etc. Although one can propose many plans, there are certain limits of reducing costs in social security areas since social security services provide basic support for lives of people, and therefore they cannot be easily reduced since it may well hurt the basis of their life. The other is economic growth. If economic growth rate can be increased, it would certainly increase the tax revenue and contribute to promote healthy fiscal balance. Contemporary Japanese economy is, however, suffering from steady decline of labor force since the end of 20th century and recently of population as a whole. Since labor force is the basic factor to support the growth of the economy, declining labor force and population is a serious negative factor to reduce the potential of economic growth. Many economists estimate that the potential growth rate of Japanese economy for the coming decade or two would be around 0.3 to 0.5 percent. This is much too low for helping to restore fiscal balance. The third is tax hike. This is the most straight-forward and powerful means to restore fiscal balance. However, tax increase is perhaps politically the most unpopular option in any country. Let me explain my proposal of tax increases in the next section. There are several types of taxes to be possibly used to restore fiscal balance: individual income tax, consumption tax, inheritance tax and corporate income tax. Among them the most equitable tax which has a large tax base is consumption tax. Let me therefore focus on consumption tax as a strategic policy measure to restore the fiscal balance. Japan’s current consumption tax rate is 8%, which is much lower than many of European countries where indirect tax which is comparable to Japan’s consumption tax, commonly referred to as “value added tax,” ranges at the rate of 20 to 25 %. In 2010, Mr. Yoshihiko Noda, the then finance minister of DPJ government promised publicly in G8 finance minister conference to increase consumption tax rate from the then 5% to 10% in order to show the commitment of Japanese government to strengthen fiscal discipline. In 2020, three major political parties: DPJ, LDP(Liberal Democratic Party) and Komei party agreed to increase the consumption tax rate from 5% to 8% in April 2014, and in October 2015 to 10%. In April 2014, prime minister Shinzo Abe increased consumption tax rata rate from 5 to 8 percent as scheduled. While the first quarter of 2014, prior to the tax hike, recorded 4.9 percent annualized increase of GDP by rush in consumption, but for the second quarter dumped as much as 7.1 percent. Perhaps because of this trauma, Mr. Abe postponed the scheduled consumption tax hike as scheduled in October 2015 till April 2017, and then he also postponed this scheduled tax hike till October 2019. And more recently, he called abruptly a general election in October 2017 for the reason of shifting the usage of 4/5 of expected increase of revenue accruing from tax hike scheduled in October 2019 to provide free education rather than to spend for restoring fiscal balance as previously planned. Such choices of PM Abe seems to suggest that he has (1) a strong trauma about the negative effect of the consumption tax increase for dampening economic growth, and (2) strong interest to buy the “browny’s point” of the voters by sprawling government money rather than to restore fiscal balance to create a more sound and strong economy for the future generations. Under such circumstances, I would like to propose the following plan of increasing consumption tax. Thai is, to raise consumption tax rate very gradually such as 1% or even less every year until it reaches the level of 20%. By doing this, the shock effect that the increase of a few percentage points such as 3 or 2 will be minimized. Since, also, the long-term plan of tax increase is given, people have to and will be likely to adapt their life plan accordingly. In other words, people will not rush to buy before the tax hike and dampen their consumption afterwards, they would rather try to adjust their life plan for a long-run. One percentage point increase of consumption tax will bring about, under the current economic structure of Japan, approximately 2.5 trillion yen tax revenue. When the tax rate is 20%, consumption tax revenue would be 50 trillion yen per year. If this tax rate is continued for 26 years, the current accumulated government debt will be absorbed by the consumption tax revenue alone. Since, it takes at least 12 years to reach this level starting from the current rate of 8%, it would take longer time to absorb the outstanding government debt. But to the extent that there are other tax revenues such as income taxes and inheritance tax, this time span could be shortened somewhat. In fact, in a aging society like Japan, inheritance tax will be an important tax revenue for the country for sometime. I urge to recommend to change the current acutely progressive tax rate structure of inheritance to reduce the general rate and expand the tax base so that greater number of people will be levied lower taxes and consequently total tax revenue will be increased substantially. If Japan can adopt this kind of long term tax increase plan, Japan will be able to get rid of the extra-ordinarily heavy burden of huge accumulated fiscal debt and establish a much more healthy and stable economic structure for the future generations. Also this will alter the current extremely unfair intergenerational differentials of life long net value of individual social account, namely, the gap between life long contribution and payment of social security and taxes, as formulated by professor Laurence Kotlikoff some years ago. The story so far has been only one-sided. It was simply the story of increasing the burden on the tax payers in order to absorb the current huge accumulated debt of the government. People will definitely not accept this kind of one-sided story. People will begin to listen only when the other side of the story that such high burden will be offset and compensated by good and reliable social services to protect and stabilize their life for life-long period will be presented. Here, I would like to propose a new thoroughly comprehensive social safety plan. The conventional social security program covers only pensions, medical care, and unemployment benefit. It was only 2000 when old age nursing care insurance was adopted. This kind of conventional social security system worked well for Japanese society during the high growth period of 1960s and 70s, and reasonably well until 1980s, when most of the people enjoyed stable employment as regular employees and secured married family life. Japanese economic, social and family structure changed drastically since then. During the so-called “lost two decades” from the 1990s and afterwards, the economy suffered from extremely low growth, nearly 40% of workers cannot enjoy stable full-time life long employment, and the family with parents and children living together became less than half of the entire families. Under such circumstances, the capability of maintaining stable life and family reproduction itself of relatively poor and disadvantaged people is jeopardized. The conventional social security services do not work effectively to meet the demands of these people. People need helpful and powerful services ranging from assisting marriage, bearing babies, fostering children, schooling, providing appropriate vocational training, protecting working conditions and against status discrimination, in addition to conventional services of unemployment benefits, medical insurance, poverty assistance, and old age nursing. The comprehensive social safety program I am proposing will provide all these services effectively and seamlessly throughout the life cycle of a person. This kind of comprehensive social safety system is obviously highly costly. However, in order to secure the support of the public about the heavy burden of 20% consumption tax system, providing this kind of comprehensive social safety and security system is inevitable. The most important political agendum we are faced in order to construct a new country where future generations can live safely and comfortably is precisely to examine, discuss and choose the new model of our country for the future. There are some political leaders who think about the need and importance of such major reforms of our country. However, critical for them is whether the public, particularly the voters, understand the importance of such agenda. Voters are alert and sensitive about the issues of gains or losses in front of them but tend not to be aware of such major issues with a long time horizon. And with the absence of voters who understand the major and long-run issues of the country, alert politicians cannot propose important policies because they will not secure votes. Such major issues need basic knowledge and relevant information to understand the meaning of the issue. Not only insufficiency of understanding on the part of the people, but often critical information is not provided to people nor even disclosed. For example, social security system is a complex entity. Ministry of welfare and labor maintains, for example, that Japan’s public pension system is durable for 100 years without convincing evidence. Also, Japanese government bonds are priced high largely because massive purchase of BoJ. The “Primary Dealers system” tied closely with the guidance of Ministry of Finance conceals the potential signal of more natural pricing. The general election held in October 2017 was a good opportunity to discuss such issues. However, the time was only a few weeks between the announcement of the election and the day of voting. Most parties quickly prepared shallow policy agenda and voters hardly had time to think about them. Under such circumstances, prime minister Shinzo Abe declared to spend 4/5 of increased tax revenue arising from2 percentage point increase of consumption tax schedule in October 2019 to provide free education for children and youths before and after the compulsory education age bracket. Whether such a proposal is meaningful for current Japan has not been carefully examined, and its obvious consequence is to delay the schedule for restoring healthy fiscal balance for the country. Important is political leadership on the one hand, and public understanding on the other. These two must be connected by full disclosure of information and serious and sincere dialogue between the two. We need to work for it together since the critical mission for political leader is to inherit a better country for the future generations, and it must be the desire of us, namely the voters of the current democratic society.